Author: Roland Kießling. Series edited by: Hans-Jürgen Sasse †. Apart from the Sandawe and Hadza, the South Cushites, i.e. the Iraqw, Gorwaa, Alagwa and Burunge, represent the oldest inhabitants of East Africa. Their geographic and linguistic restriction to central Tanzania is only a small remnant of their former, more widespread settlement throughout the whole of East Africa, before the arrival of the Bantu and Southern Nilotes. On the basis of data drawn from the four modern representatives of the West-Rift group of languages, the defining characteristics of their common predecessor language (proto-West-Rift or proto-South-Cushitic) are reconstructed using the phonological, morphological and syntactical methodology of historical comparative linguistics. The connection with Cushitic in general is defined, and the historical development paths of the individual South Cushitic languages are detailed step by step. The linguistic results are further enhanced by a synthesis with findings from adjoining fields of study, e.g. oral literature, demographics, social and economic history, to elucidate the changing and variously intensive relationships with neighbouring ethnic groups, like the East African Khoisan, Bantu and Southern Nilotes. Using the described example, the study in general aims to explore the methods of a historical socio-linguistics in an African context. Kießling’s book represents a complete comparative-historical grammar of four South Cushitic idioms, Iraqw with Gorwaa, Alagwa and Burunge. His West Rift reconstructions are based on the methods of internal and sequential reconstruction. [...] The comparative grammar written by Kießling represents an excellent springboard for the lexical reconstruction, prepared by Kießling, Mous  on the basis of their field research, naturally with knowledge of the results of their predecessors. 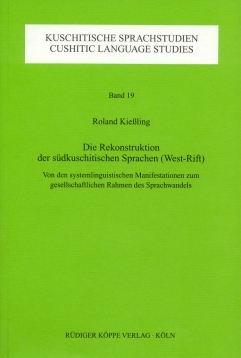 [...] Summing up, the monographs of Kießling and Mous present the West Rift grammar and lexicon in reconstructions based on the extraordinary strict methodology. They offer at our disposal a maximum of possible in this field.